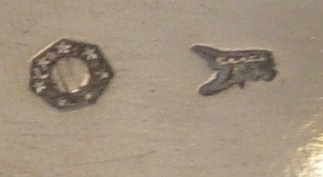 This is a selection of Italian silver salts made in Italy in the 18th and 19th century. 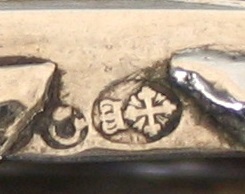 All bears the hallmarks of Ancient States (Antichi Stati) into which Italy was divided before its unification operated in the second half of the 19th century. 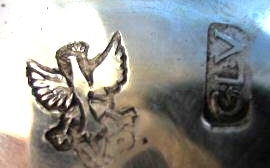 Most of them belongs to Giorgio Busetto's (www.silvercollection.it) private collection. This is a 'trencher' salt cellar made in Venice (Italy) in the 18th century. 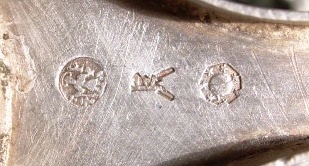 The salt is embossed on a thin sheet of silver (loaded with another material) and stands on four ornate feet. 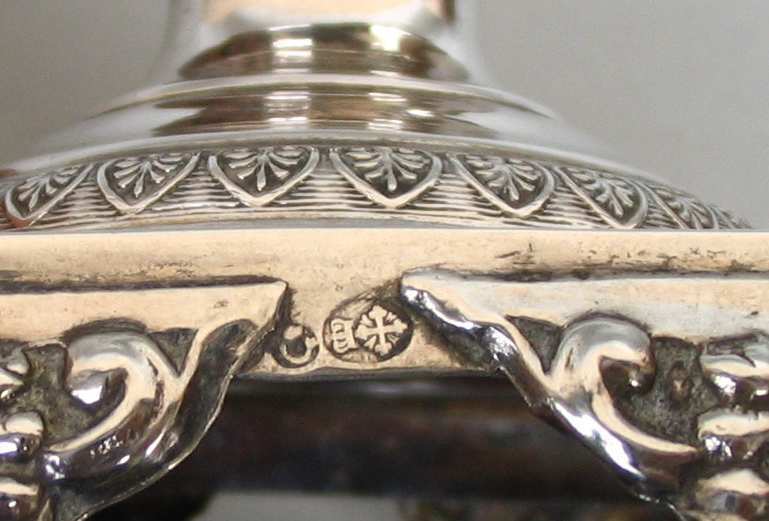 The bowl has traces of gilding and the rim is decorated with foliate motifs. 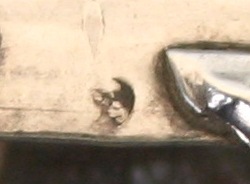 The hallmark is faint and difficult to read, but it is the 18th century 'lion' of Venice with silversmith hallmark F? (maybe FB). 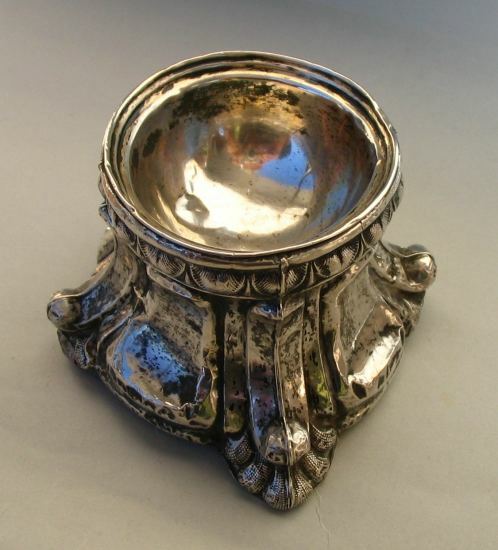 This silver salt cellar was made in the Stato Pontificio - Rome (Italy at the end of the 18th century. 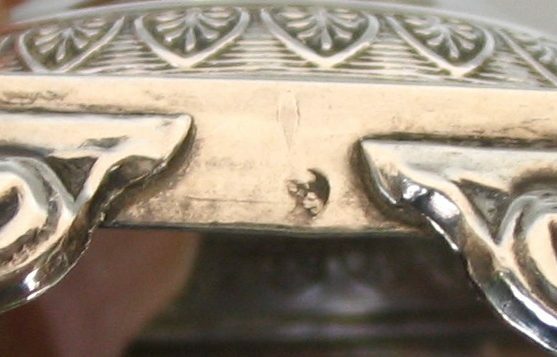 It is inspired to Adam style with festoons, lion's heads and four paw feet. 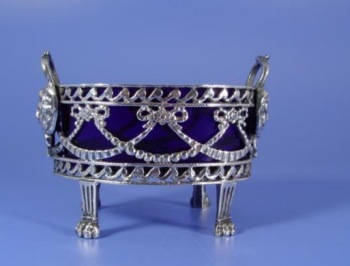 The blue glass liner protects silver from salt corrosion. 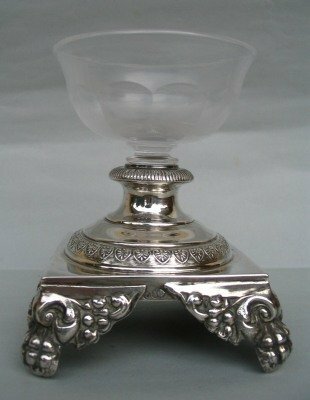 This salt cellar has a silver stepped foot, chased with floral motifs supporting an octagonal cut glass bowl. 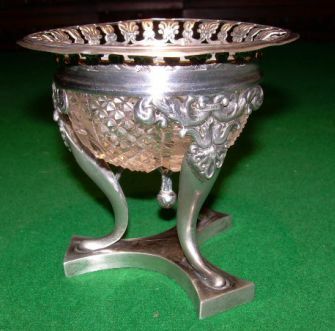 It was made in Milan in the first half of 19th century. 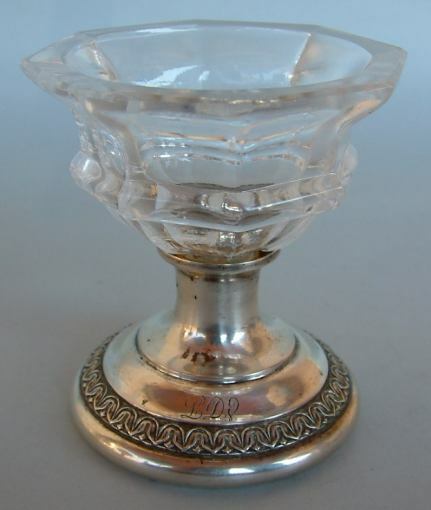 The glass bears the mark "Baccarat" and the silver foot has engraved initials LDV. 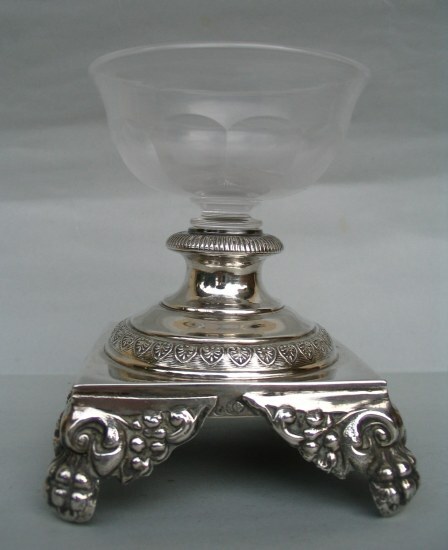 This is cut crystal salt cellar standing on three legs with neo-classical motifs. It was made in Milan in the first half of the 19th century. 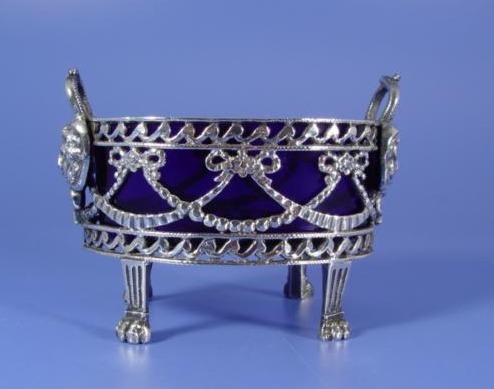 This is an Empire salt cellar made in the Regno delle Due Sicilie (Naples) at the mid of 19th century. 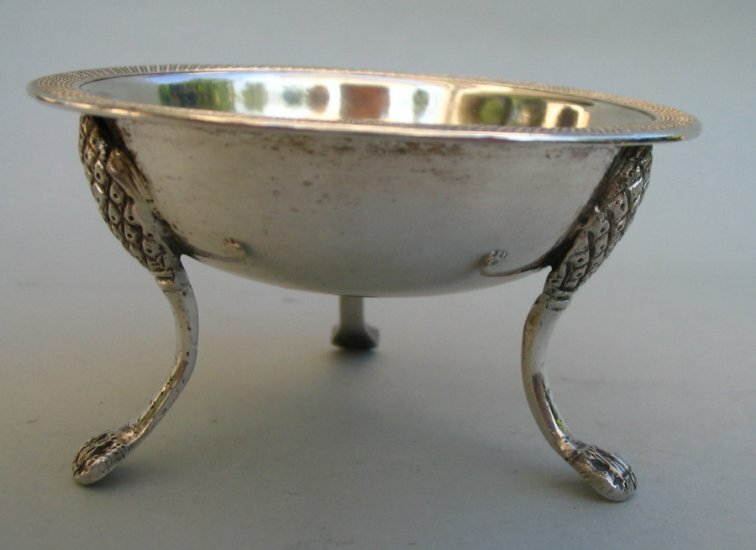 It has a bowl of circular shape, standing on three paw feet connected to the bowl by pine cone motifs. 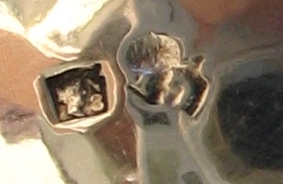 It is hallmarked on the bottom with 'Testina di Partenope' (head of Partenope: purity degree 883/1000) used in Naples from 1823 to 1872 and silversmith hallmark G? (mark not clear). 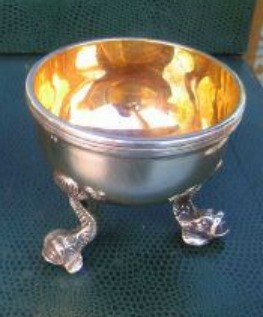 This is a silver salt cellar standing on three feet in the shape of dolphins. 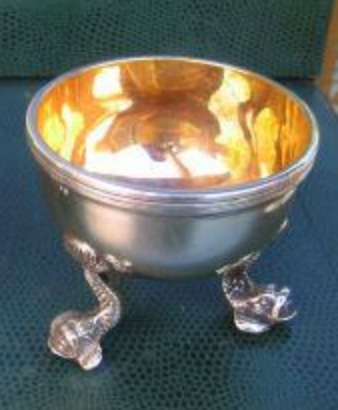 Bowl's interior is gilt. 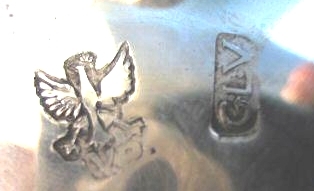 It bear the mark of the Regno delle Due Sicilie - Palermo (Italy), first half of the 19th centurys, silversmith G.L.V (not identified).